According to AT&T’s own website, the upcoming Samsung Galaxy S7 Active will be included in AT&T’s BOGO smartphone offer. Since the Samsung Galaxy S7 is currently unofficial, the logical interpretation is that the S7 Active will be included in the promotion once it launches later this summer. One AT&T website page that describes the terms of AT&T’s recently-expanded BOGO smartphone offer, the carrier lists the Samsung Galaxy S7 Active as one of the devices included in the promotion. Since both the Galaxy S6 Active and the Galaxy S7 Active are listed in the fine print, the possibility of a typographical error is slim at best. By now, we’ve seen enough bits of evidence to be fairly confident that the Samsung Galaxy S7 Active is a real device. According to previous rumors, the rugged version of the Samsung Galaxy S7 flagship will land on AT&T on June 10. According to previous leaks, the Samsung Galaxy S7 Active will make use of a lot of the hardware components that adorn the standard Galaxy S7. Included here are the Qualcomm Snapdragon 820 chip with 4GB of RAM and the 12MP/5MP camera setup. When it comes to the Samsung Galaxy S7 Active display size, rumors and leaks have provided contradictory information in these past few weeks. Some sources point at a 5.5-inch QHD display while a recent leak lists the S7 Active with a 5.1-inch QHD display. Other rumored specs include a 9.9mm rugged body with a weight of 185 grams, as well as a 4,000mAh battery pack that’s expected to provide sufficient battery juice even for an entire day of heavy use. 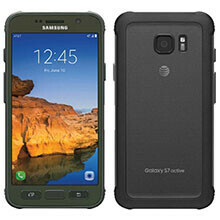 Like the Samsung Galaxy S6 Active before it, the Galaxy S7 Active is expected to be an AT&T exclusive. The active line is a great phone. If only they would do them in better colors. My son has the black s6 active and that colors is the best. It is a nice phone and has great battery life so the s7 active should be awesome. weaksauce att exclusive, bring this device to Europe! Note 6 and Galaxy s7active BOGO, really want both of these phones. Hope they do It. Very unfortunate that this is AT&T exclusive. I would buy this phone in a second if T-Mobile carried it. It's too bad this is locked to AT&T, because with the reports of screens cracking just by looking at them wrong, this is going to be the model to buy if you want some Galaxy S love.